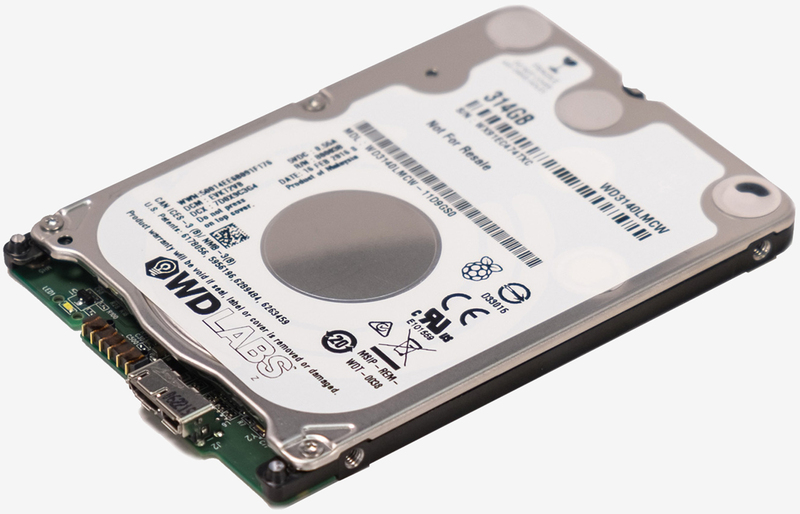 WDLabs, a division of Western Digital, has unveiled a new hard drive built specifically for the Raspberry Pi. It's called the PiDrive and predictably, it offers up 314GB of storage. The PiDrive 314GB is based on the company's high-volume 500GB platform but was designed specifically for the Raspberry Pi. It's a 2.5-inch, 7mm thick drive with native USB 3.0 / 2.0 support. WDLabs said customizations were made to the drive's magnetic recording and electrical operating set-points to reduce the electrical power load of the drive on the Raspberry Pi while still maintaining optimal transfer rates. WDLabs also offers a PiDrive Kit that comes with a 2.5-inch 1TB hard drive, a 4GB microSD card with SD card adapter, a PiDrive enclosure and the necessary power adapter / cabling. The kit sells for $79.99 which some may feel is a bit too cost prohibitive, at least in the grand scheme of things when you consider a new Raspberry Pi 3 will set you back just $35. Raspberry Pi CEO Eben Upton said the PiDrive 314GB gives its community a low-cost, purpose built hard drive solution that helps them develop even more innovative and unique ways to use Raspberry Pi. The WDLabs PiDrive 314GB hard drive carries a suggested retail price of $45.81 but is being offered with a limited-time discount of 31.4 percent, bringing the final price to $31.42 (yesterday was Pi Day, after all).